One week from today I leave for Washington and Oregon – 48th and 49th state to visit. My nephew and his girlfriend are coming along and I’m happy to have the company. We’ll be backpacking in Olympic National Park – The Enchanted Valley trail and the Columbia River Gorge – The Eagle Creek Trail. Nervous? You bet. Have I mentioned the longest I’ve hiked in the past… ohhhhhh 20 years.. is about two miles??? Yep. Of course, that doesn’t count the craft fair that comes to the Oklahoma City Fair Grounds every fall and spring. It fills about seven of the buildings and I walk every single building, every single aisle! Ends up being about five miles carrying armfuls of purchases! LOL Does that count? I’m just sayin… But I digress.. I have wanted to go on this type of backpacking trip for years and years but never can find anyone to go with me and as a beginner backpacker I’m figuring going alone is not such a good idea. I’ve been doing a lot of preparation… uhmmm not physical preparation mind you.. research.. the good stuff.. researching which trails to choose… what to bring… I’ve even been reading some fun books like A Walk in The Woods by Bill Bryson. Hysterical and interesting recounting of the author’s trip on the AT (that’s how we backpackers refer to the Appalachian Trial). I’ve also downloaded an Audible Book Lost: From Lost to Found on the Pacific Coast Trial (what we Backpackers would refer to as the PCT). It’s not beyond my notice that most of my preparations involve sitting on my hiney. That may be a problem. But I’ll worry about that tomorrow (ala Scarlett). All the prepping started, as usual, with a list. I like using the spreadsheet function of Google Documents to keep my lists. Especially if I plan on sharing the list with others because it’s simple to do via Google Docs. If I don’t plan on sharing a list and want to easily sync between my Mac, my iPad and my iPhone then an App I like to use is Wunderlist. Once I completed THE list, I began making spin off lists… lists of stuff I already had.. lists of what I needed.. divided by the stores I needed to get them from… ahhhhh lists, glorious, lists. 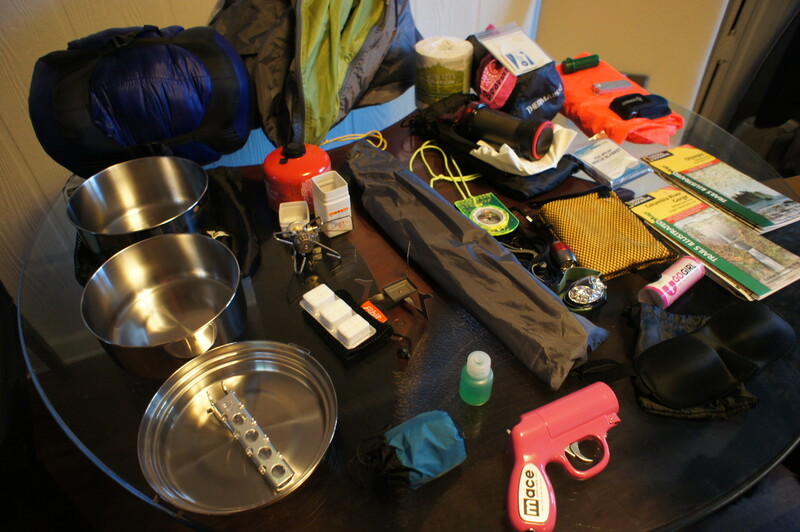 So, here’s all my gear laid out on the table so I can check it against my master list prior to packing. Click here to go to a picture where you can rollover each item and find out what it is and where to get it. The picture doesn’t include my food or clothes. Also missing from the picture are my “bear rope” to tie food and anything else that smells in the trees so the bears can’t get it, my Big Agnes Camp Chair, trashbags, whistles and all my techie stuff (iPad, camera, iPhone – the essentials!). This is going to be an adventure!! !